The mid-term elections? The only political axiom to which I subscribe is that no matter where one stands on the political spectrum, much of the truth is usually somewhere else. I think both parties have lost the plot and are only concerned with elections and not with governance. I think too many Americans have succumbed to what I call the bulls**t binary political paradigm, that you have to be an adherent of one major party or the other. Too many Americans don’t understand that many ways exist to define the role and scope of government and its relationship with the population. For me, the right to vote means the right not to vote. I don’t think anyone should brag about voting for the lesser of two evils. If I don’t vote it is not a vote for the person you oppose, it is a vote for no one. “An innovative assortment of electric, steam, and ‘internal explosion’ engines powered these horseless carriages. New manufactures like Olds Motor Works of Lansing, Michigan, built models of each kind to compete in the developing market. The manufacturers presented 160 different vehicles at the first national automobile show. Future leaders of the the nation’s greatest transportation industry gave driving and maneuverability demonstrations on a 20-foot-wide track that surrounded the exhibits. A wooden 200-foot ramp tested hill-climbing power. Everything old is new again. At the beginning of the 20th century it was not clear how popular the automobile would be nor was it clear which power source would “win” the battle. Electric cars were quite popular as were steam-powered cars. The only constant in the world is change. 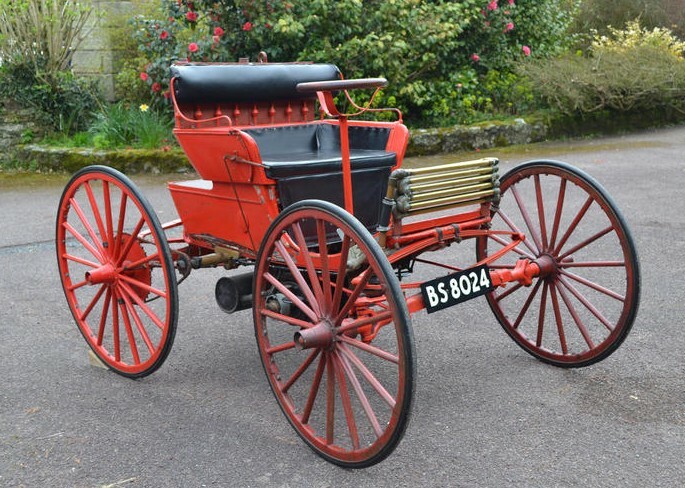 I have read that none of the automobile manufacturers that participated in the 1900 show are still in business and yet the automobile industry continues to thrive even with occasional bumps in the road. According to one of my favorite books, History of the American Auto by the Auto Editors of Consumer Guide®, for 1899-1900 the most popular car in America was made by Columbia with Locomobile in second. Columbia was the brand name used by the Pope Manufacturing Company that was far more famous for its bicycles, most of which also used the Columbia brand name. Except in appreciation for their role in establishing the automobile I don’t have interest in these ancient cars. I would never own one no matter what my net worth. The oldest cars that interest me, and this has changed in the past five years or so, are cars from the 1930s. Do you have interest in “brass era” cars? What are the oldest cars that interest you? I respect your opinion about not voting; however, I disagree with you premise. If you do not vote you leave your choice of who represents you to the complete partisans of both sides, especially in the primary elections which choose who runs in the general election. All votes count and many elections especially in the primary and local elections turn on a few hundred votes or LESS. For instance in Arizona Congressional District 2 in 2014 the general election went to the Republican on less than 200 votes out of over 230,000 cast. Do NOT give up on our republic and it’s method of choosing representatives at all levels. Please choose to vote. On the car show it is interesting that you mentioned Olds. My memory (and Wikipedia) tell me that Ransom E. Olds was a definite pioneer in the automobile industry building not just curved dash Oldsmobiles but also the REO Speedwagon (cars and trucks not the rock band). The REO are his initials. Yes, Random Eli Olds was a pioneer and, apparently, not always easy to get along with. (Ugh, I hate ending sentences with a preposition.) The Curved Dash Runabout, of which a prototype was shown at the 1900 New York Auto Show, led Oldsmobile to the top of the US auto sales race in 1903, 1904 and 1905 after a running a close second in 1902 to Locomobile. Seriously, though, term limits would help break up what has become the Permanent Bi-Partisan Fusion Party. It just boggles my mind that Congress has an approval rating (if you can call it that) of 11% or 12%, but incumbents are re-elected more than half the time they run. THAT is hypocrisy.